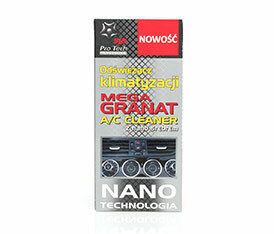 Mega Granate, it s a modern product for cleaning and refreshing vehicle air conditioning systems. Application of Nano Technology provides long lasting freshness. Nano silver particles efficiently and for a long time, struggling with an unpleasant odor, arising during operation of the vehicle. This preparation is unlike any other available on the market products, working not only in the applications, but also long after its completion. Nano silver particles form a unified structure for active molecules that effectively fight the unpleasant odors. Shake well before use. Start an ingine and air conditioning. Open all the air inlets and close the windows. Start air closed circuit. Find the air inlet (usually is under glove compartment in front of passenger seat.) Dismount air filter. In case of cars with air blowers in front of air filter so blowing out the air from the filter, close the air filter hatch. Remove the element of carton with perforation. Put the product in a proper way, in perforated box, direct steam of the air into air inlet. Push and block the botton of areosol. Step out of the car, close the door. Wait 10 minutes. Remove empty product from the car. Assamble new pollen filter.